The Voyager KVM DVI Extension series supports the DVI graphical interface and extends any PS/2 or USB-based KVM set up to 150m, using simple CAT5 cabling. Due to the full digital transmittance technology, even the maximum possible extension will not produce any loss of resolution. The Digital Visual Interface (DVI) was designed to maximize the visual quality of digital display devices such as LCD panels and projectors. In areas where security and pollution are important factors, the computer units are often installed in a remote location. 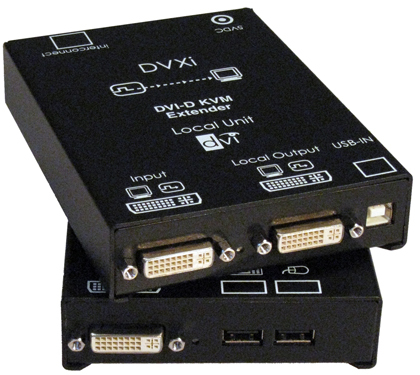 In order to have a local user interface, KVM is required. A typical example is in public places where LCD panels are used. The Voyager DVI Extender series supports the DVI graphical interface and extends the PS/2 or USB keyboard up to 150 m over simple CAT5 cabling or via fibre cables in multimode up tu 400m.